Piggy's Revenge : The countdown begins! IT'S PIGGY TIME, are you ready? The weather looks like it will cooperate this week-end with highs in the low 70's and a 10% chance of rain.Those are near perfect conditions for our fourth version of Piggy's Revenge. You can register the day of at $40.00 as soon as we can get into the park and get organized. The gates open at 7:00 AM. The pre-registered will have to sign in and pick up their T-shirt, but those that are signing up on Sunday will have to wait till after their ride to see if we have any leftover shirts available. The trail head parking lot has limited spaces available, the overflow will have to park on the shoulder of the access road and the road leading to the horse trailer parking lot. We cannot park in the Horse lot since they need room to move their trailers around and avoid blocking the roads as much as possible. If a horse trailer decides to show up on Sunday we don't want them to clip any cars. There will be a short riders meeting around 8:00 AM right before the start. The 60's will leave first with a neutral ride to the first turn, make sure you have the current route downloaded on your GPS and follow the link at http://connect.garmin.com/modern/course/8532487 (Make sure you have the 2015 version loaded). If you are using a phone as a GPS make sure you have enough battery power to last the whole ride, I would suggest bring a extra power source. The 20 and 40 's will leave next; these two routes share the first 10 miles. The faster riders should work their way to the front during the neutral start section, there are few opportunities to pass on the single track, so call out before you pass and if you are holding up traffic stop and let riders pass you. If you encounter other users (walkers, Horses etc...) be courteous, you are representing the whole cycling community. The 20 and 40 will be marked with paint and occasional signs, don't over think it too much, just follow the arrows. SAGS: the 20's at mile 11.
the 40's at mile 11 and 30. Plan your water and food accordingly. While riding, don't forget to look up and enjoy the view. The feeling being in the middle of nowhere is rare these days. 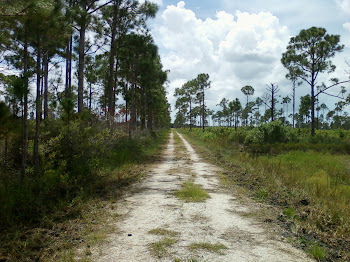 Hopefully you will get to see some wildlife, the deer will be curious and fearless, the pigs will run away if you make some noise (they can be aggressive so give them room), the alligators will eventually move if you give them some time, watch your feet when you stop we have a lot of fire ant nests and snakes. Keep your eyes open for a panther that was sighted in this area recently. DO NOT TOUCH THE PIG TRAPS. Remember we can't go out and get you, so make sure you have the spare parts and knowledge to get you back safely to the start. YOUR ARE ON YOUR OWN! ALSO.... Due to Facebook changing their policies, we had to make a new page. We are now under SCORR Riders. I know, timing is everything!